Items in the bespoke stationery range are usually available in the following cardstock. Any restrictions will be detailed on the individual item pages. Please note that cameras and different viewing screens can affect the way that you see the images on this page. While full invitation samples are chargable, we will be happy to send through 2 card swatches for you for free. More than 2 will require a £1 admin fee for every 5 requested. Broderie card is inspired by fabric textures and features a 3-leaf Embroidery embossing on one side and is Matt white on the reverse. It is the perfect choice for exclusive wedding stationery! This card-type is approximately 300 gsm. 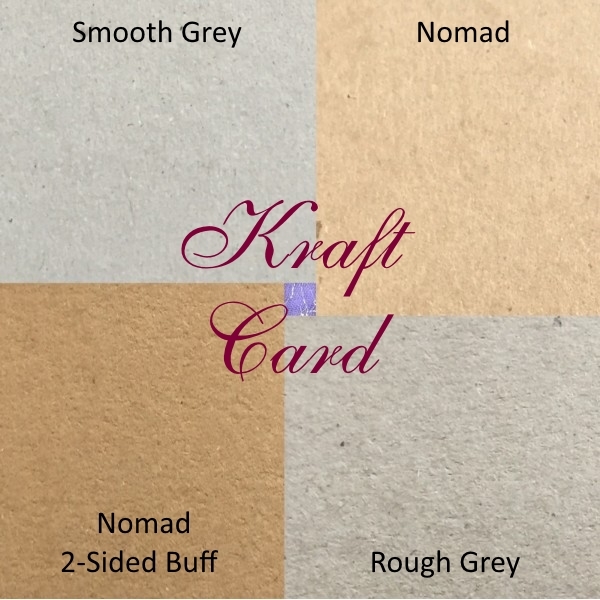 The Kraft board is made from 100% recycled materials and are subject to slight colour variation by batch. The weight of this card is approximately 350-365gsm. 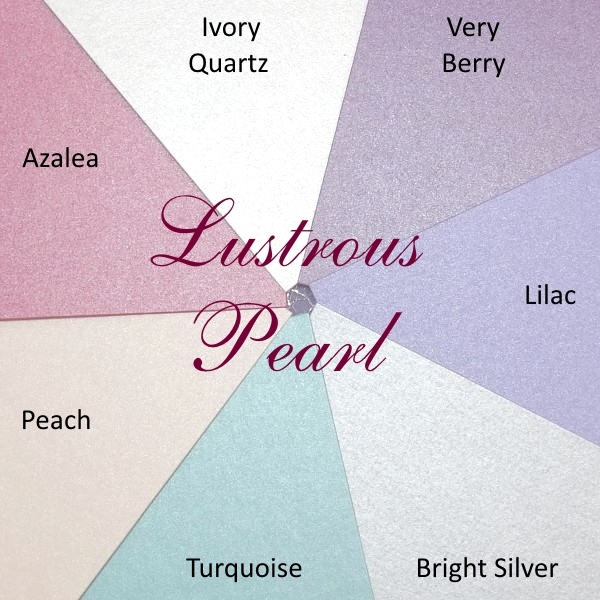 As with the Premier Pearl range, the Lustrous range of cards is a lovely pearlised board that has colour all the way through, not just on the one side. This card-type is approximately 285 gsm. 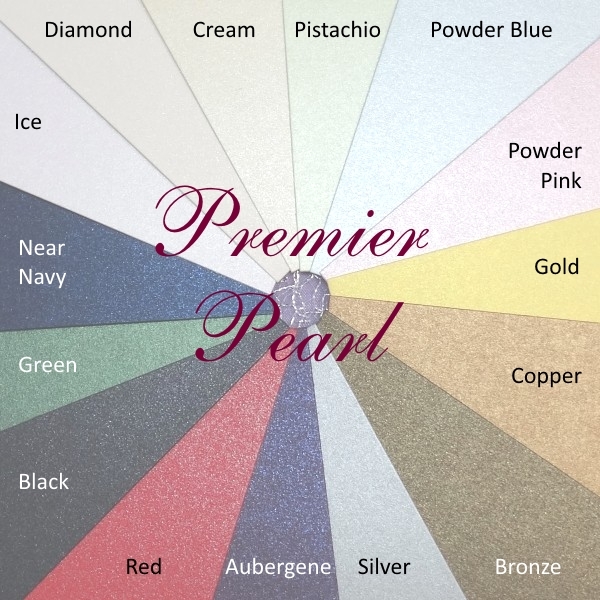 As with the Lustrous range, the Premier Pearl range of cards is a lovely pearlised board that has colour all the way through, not just on the one side. This card-type is approximately 290 gsm. 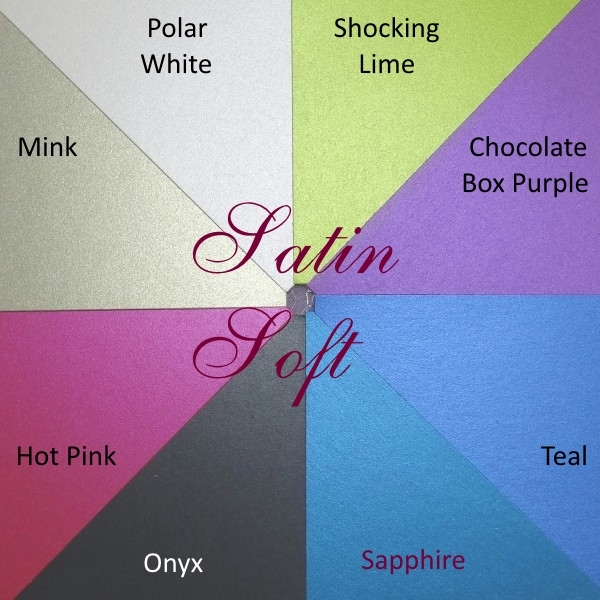 The Satin Soft range is an impressive card that is pearlised on both sides and has a feel that is incredibly soft and smooth. Please note that this card-type does feel thinner than the other card types, at approximately 250 gsm. Irridescent glitter on a pearlescent card, 'Crystal' is one of our most stunning card types for any style of invitation. Although the glitter is mounted on a white pearlescent card using a special technique, it can be applied to any of the card colours (please note that the card colour will appear signifcantly paler when the irridescence is applied. The pearlescent card is 290gsm, with additional weight of the glitter on top of this. Sheer Decadence is one of our most luxurious boards. It is a top quality Italian Ivory Board which has a Gold Dust Shimmer running right though. This exquisite card also has a light cord embossing on both sides. This card-type is approximately 290 gsm. Irridescent glitter on a pearlescent card, 'Crystal' is a simply stunning card type for any style of invitation. Although the glitter is mounted on a white pearlescent card using a special technique, it can be applied to any of the card colours (please note that the card colour will appear signifcantly paler when the irridescence is applied. The pearlescent card is 290gsm, with additional weight of the glitter on top of this. Do not be fooled by the Linen being one of the cheaper card options. These cards all have a lovely linen finish on the front, and a matt finish on the reverse. These are perfect for any handmade cards, including wedding stationery. This card-type is approximately 280 gsm. 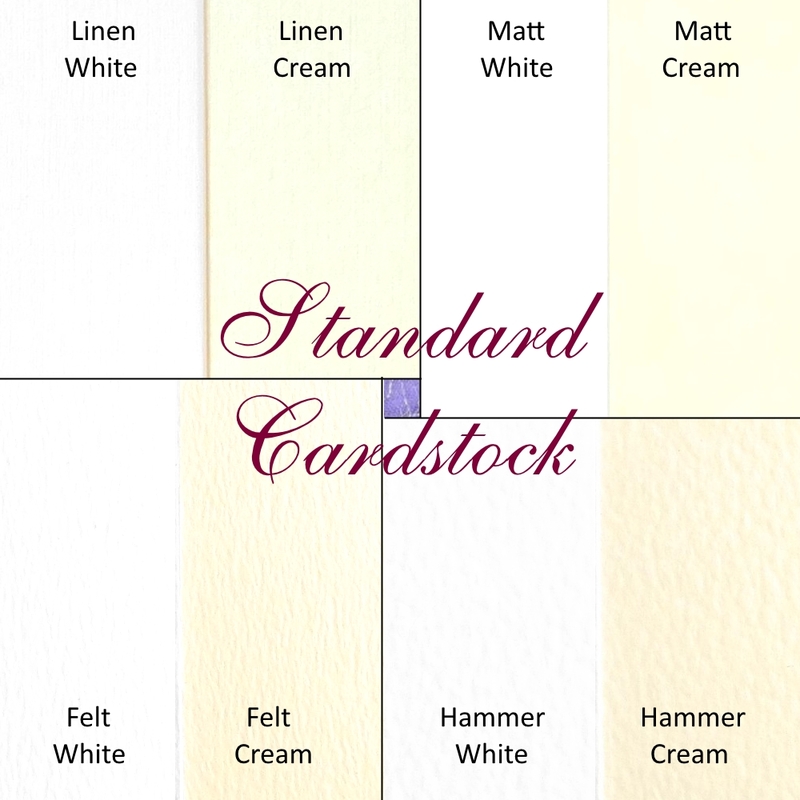 These cards have a matt finish and are great for any handmade cards. This card-type is approximately 280 gsm. The Felt Marque card is a lovely double-sided card featuring an uneven texture on both sides with the colour running right through. This card-type is approximately 270-300 gsm. A lovely texture, this card-type is hammered on one side, and smooth on the reverse. 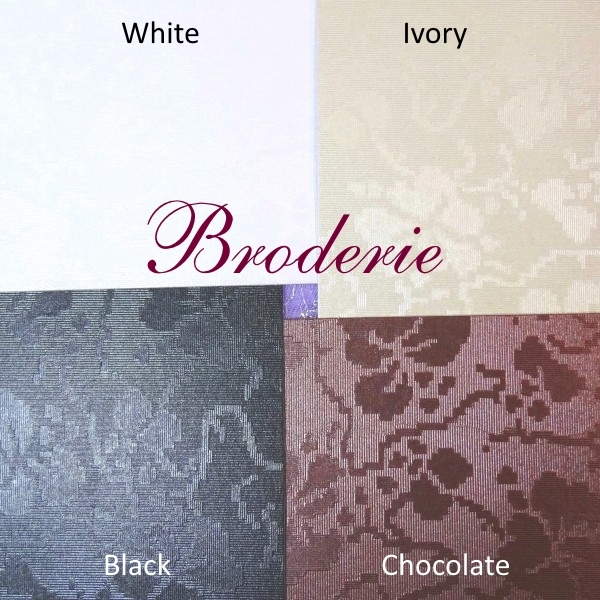 The White is very slightly off-white, while the Ivory or cream is a light creamy-white. It appears darker in the image below. This card-type is approximately 300 gsm.